Note: If you are not able to read above arabic text, just click on the images they will open as bigger images. Please visit here, to know virtue of ahad nama. PS: if you know any authentic Hadith regarding virtue of Ahad Namah please provide me through comments, also dont forget to mention reference. 1. Corrected Hamdan to Ahadan as pointed out by sister Nasima via this comment. 2. Made one more correction as pointed out by brother Yousuf. Brother i have just put ahad nama here, for the reference. I dont know hadith regarding it. But if you see, its like a dua, so nothing wrong if u recite. Ask that hafiz, “Which part of the Quran does Dua Qanoot come from? It is not in the Quran!” Yet we have to read Dua Qanoot in Witr Salaat. Keep away from such ignorant hafiz. Hmmm. Let’s see who is ignorant here. Ismail Sait said: “…in which of the version does ahadnama comes in Holy Quran Or Hadees please reply me”? The derogatory reply he was given by meemconnection is an insult to a common sense Muslim. Qanoot is not in Quraan but came from a man about whom there is not an iota of doubt that he was 100% confirmed Rasool Allaah and, just as Allaah, Azza wa Jall, says in His Complete Book, that in matter of deen, he says nothing on his own except with His permission and is inspired by Him. Now come again and explain who had the Wahee after Rasool Allaah who was given this “Ahad Nama”? This collection of Isnaads for Dua is taken from a booklet in Urdu entitled ‘ Ganjeena Akbaari’ published Kutub Khaana ‘ Ishaatul Islaam. These Du’a may also be found in the well known book ‘Faqri Majmu’a Wazaa’eef’ as well as in the books ‘Yazdah Surah Shaeef’, and ‘Majmu’a Wazaa’eef’. The Isnaads found in this booklet [presently in your hands] are English renderings of isnaads found in Ganjeena Akbaari although Isnaads for these Dua are also found in the above cited works as well some what in greater detail. Can u please tell me about the authenticity of Dua Ahad Namah, Dua Jamilah and Dua Ganjul Arsh and also Durood Ghousia…please tell me ..I am reading these things…. Illah Birahmatika Faj Alli Indaka Hamdan Tuwaffihi Ilaa Yawmil Qiyaamati Innaka Laa Tughlifulmiyaad. Here—— instead of “Hamdan”, it will be “Ahadan”. I dont know about it. Please consult some known Aalim. Its would be good it you read as many thing as possible for the departed dear. Everybody Should Learn This- AHAD NAMAH , It ‘s a Very Beautiful DUA. This dua is taken from Sahi Hadees. Please recite this dua on Thursday Night or after every prayer. It is a powerful dua for Prosperity, health & happiness & overcome from Black Magic. Thank You! Can you cite the Sahi Hadees? Now I am confused for sure! I read Ahadnama everyday and few more doa’s from a book but not sure whether they are quoted from Quran. How can I check the autheticity of the doa’s I read. Specially the Darud’s. Dua… Dosen’t mean it should be from Quran or Siah Sitta i.e. 6 Quatub e Hadees – Bukhari, Muslim, Nasai, Ibne Maza, Mahfoom Tabrani & Tirmizi. All is to Arabic Language…. If any person ask ALLAH (SWT) anything in Arabic Language… & anyone can say that it a Dua…. But my friend its our responsibility to know Arabic Language…. Because by this we all will clearly understand what we are saying….. Please All…. Always ask ALLAH (SWT) for anything in Arabic Language… Because its the best language nearest to ALLAH. Adeel, you are right in that Arabic is the best language for Dua for the Muslims, but it does not mean we cannot say Dua in our native language. Did Allah not send 124,000 Messengers give or take? None of them spoke Arabic except the Final Messenger, our Nabee Muhammad sal Allahu alaihi wa sallam. Yet Allah chose the 124,000 Messengers and answered their prayers in their own languages. Therefore if we can express ourselves in the Ajmee (non-Arabic) language, even that is acceptable to Allah. Allah accepted their prayers which were not in Arabic! Therefore, Dua is any praise of Allah in any language, it is accepted by Allah. Dua is not necessarily an Ayat from the Quran, it is a praise and acknowledgement that Allah is our Rabb and we ask him in the best way we know how, so that He may answer our prayers. To answer Mehbuba: From the above it should be clear, that there is no need for authenticity in Dua. Dua is any PRAISE of Allah, likewise Darood is sending Blessings / Salaam on Sayyidina Muhammad sal Allahu alaihi wa sallam. If we truly ask Allah for our needs in any language by PRAISING Him, insha Allah, Allah will accept our Dua. Only Allah Knows Best – Wallahu Alim. please give a reference ”assalam valeikum varahamtullahi vabarakatuhu vamagfirtuhu” is this sunnah? 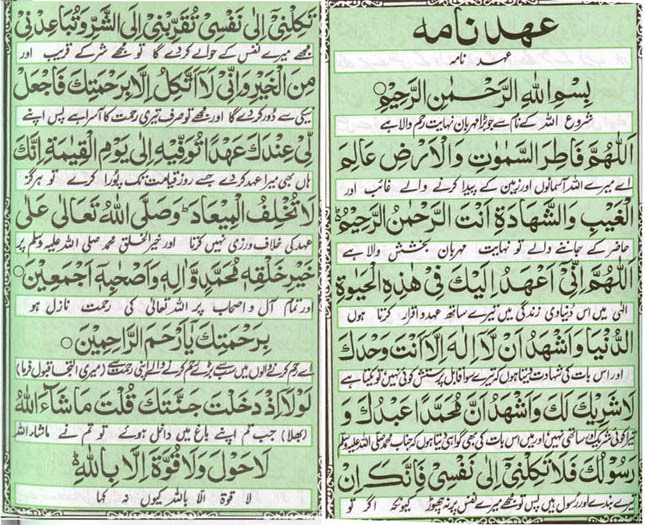 which surah is ahad namaa??? there is a mistake in arabic text, in rasoolaka there is no kaaf. you can compare it here and make out the mistake.